When we were planning our trip to Japan, we had a hard time figuring out what to do in Tokyo. 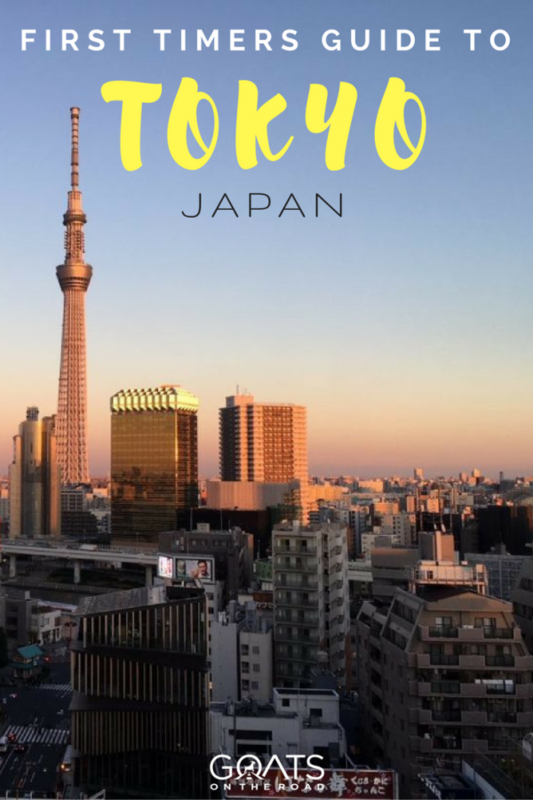 The city is massive, there are numerous areas we could stay in, and there are so many things to do in Tokyo that we found it hard to narrow down our itinerary. The city of Tokyo is a bustling metropolis with something for every type of traveller. As with other large cities with endless things to do, you’ll want to come up with a bit of a game plan before arriving, or you’ll be wasting your time planning while on the ground. If you’re wondering what to do in Tokyo, you’ve come to the right place. This city delighted us with its unique neighbourhoods, excellent accommodation, numerous activities and of course, amazing restaurants! At a very minimum, you’re going to want 3 days in this awesome city. We spent 5 days in Tokyo, and could have stayed much longer. 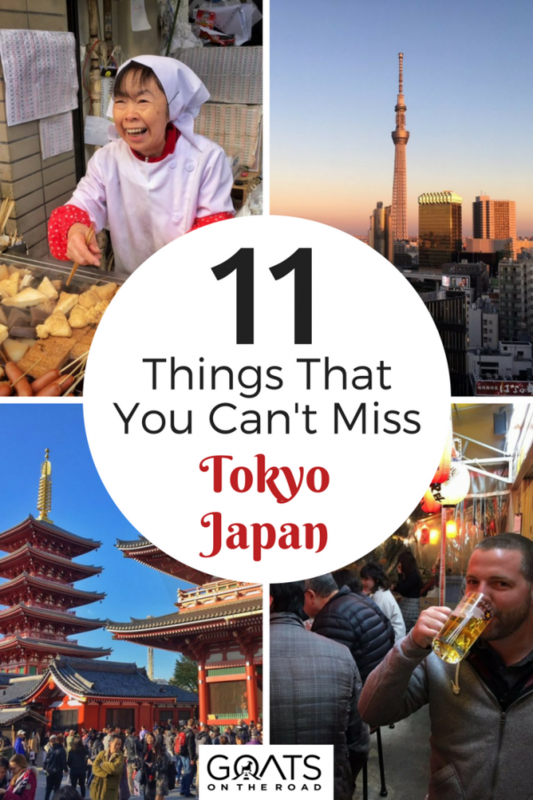 In this post I’ll break down a list of our 11 favourite things to do in Tokyo, plus a few things you’ll need to know before you arrive in the city and where to stay in Tokyo. Even though Japan is thought to be a leader in cutting edge technology, the lack of WiFi in the country is surprising. Depending on where you stay, you may find that wifi isn’t available in your accommodation. And, if you want to get a SIM card for your phone, most companies require you to be a resident of Japan and have a Japanese bank account. But, there are a couple of options available. Most travellers pick up a wifi hotspot device at the airport when they land, and drop it off when they leave. We got our device with Vision Global WiFi, which has a variety of plans not only Japan, but worldwide. In fact, they offer hotspot devices and SIM cards for over 130 countries. In Japan, Vision Global offers SIM cards with 4GBs of data for 8 days. The cost of this SIM is $20. Depending on the device you’re using (smartphone, laptop, etc. ), up to 10 devices could be connected to the WiFi hotspot device but the speed could be slow, so between 3-5 devices are recommended per hotspot. If there are 2 or more of you travelling to Tokyo, it could save you money if you all hook up to 1 hotspot device. There’s no hassle with setting up either, you just enter your password and it’s good to go. 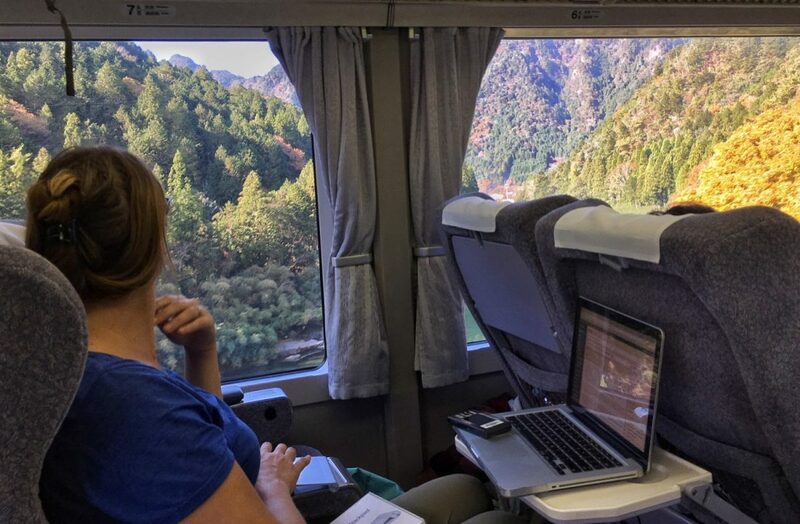 We also used the device to stream movies and to connect our laptops so we could work on the train journeys. This would have used up a lot of data on a SIM card so we’re glad we had the hotspot. The transportation in Tokyo (and Japan as a whole) is a bit confusing, especially for first timers. There are 2 different subway operators, plus the major player – JR Rail. The price of your journey will depend on which line you’re taking. The best way to tackle the subway lines is to have a Suica Card, which is like an Oyster card in England. These transport cards don’t give you any discounts, but it saves you trying to figure out how much money each journey will cost and how to use the pay machines. Plus, the card will save you loads of time as you just need to scan it and you’re good to go. You can purchase the Suica Card at a JR ticket office in any of the train stations. Speaking of JR, this is the major rail company in Japan. 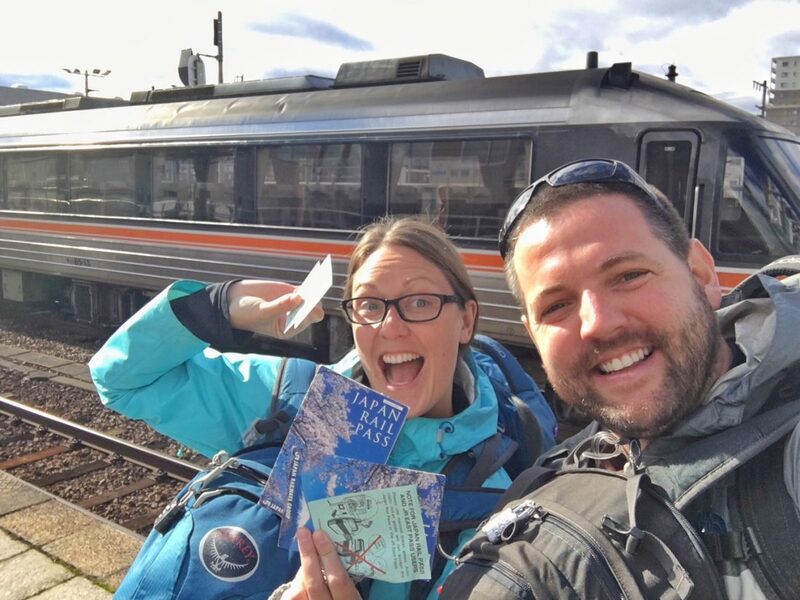 I recommend having a JR Rail Pass for your trip, which is something that you need to order online ahead of time. We ordered ours with JTB USA. There are numerous types of passes you can get (7 day, 14 day, 21 day, plus different classes). These passes allow you to travel around all of Japan, and on certain lines within the City of Tokyo. You’ll pick up your pass at the airport when you land. Before you even figure out what to do in Tokyo, you’ll need to choose where to stay. The city is large and there are numerous neighbourhoods – each with its own character. Tokyo is well connected so no matter where you stay in the city, you’ll be able to easily get to all of the sights by public transport. The sights that I list below are mostly found in Asakusa, Shinjuku and Shibuya neighbourhoods. We stayed in Asakusa area, which is known for being more low-key, authentic and a place that retains its old Tokyo charm. 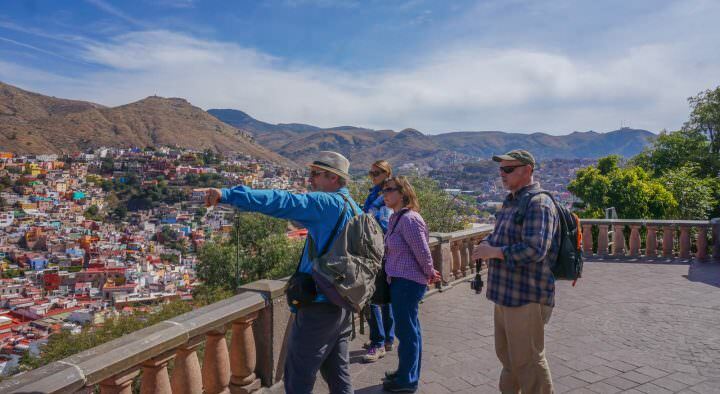 Here you’ll find more residents than tourists, quieter streets, pretty temples, great restaurants, and cheaper prices. We enjoyed this part of Tokyo, and if (when) we return to the city, we’ll be staying in this area again. This boutique hotel offers the amenities of a hostel, but with an upscale vibe. The moment we walked in, we were in awe of the gorgeous architecture and unique touches around the lobby. 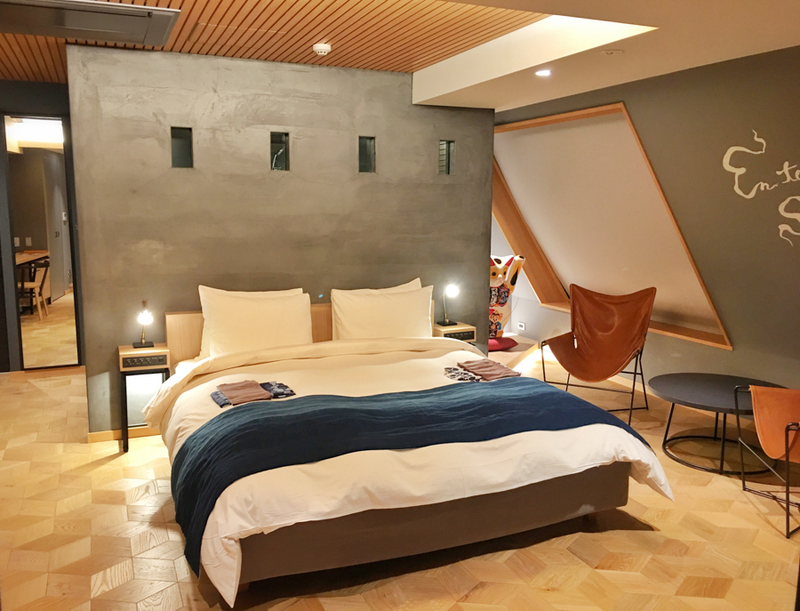 Together with local Asakusa craftsmen, the hotel was built and designed. With community in mind, Wired Hotel has become a place for local gatherings and cultural events in their Zakbaran restaurant. We stayed in 2 different rooms at the Wired Hotel and both were exquisite. The beds are incredibly comfortable, but we especially loved the Yukata for us to wear, the guidebook created by locals, and the little touches of artwork around the room. Click here to see the latest prices of the Wired Hotel on Booking.com. If you want awesome views of the Sky Tree, complete with fantastic service, then definitely check out the Gate Hotel. The reception is located on the 13th floor, which is where you’ll also find the restaurant. 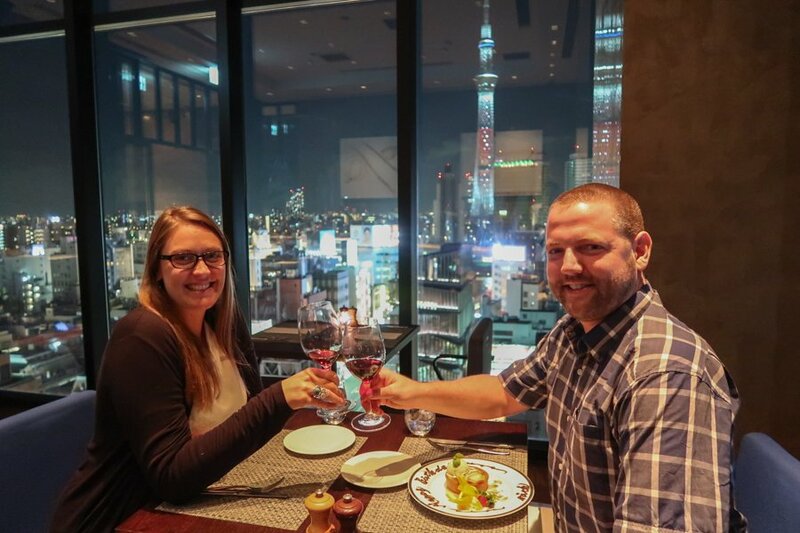 The glass windows offer fantastic views across the Asakusa neighbourhood, but for an even better vantage point, head up to the rooftop bar and patio! 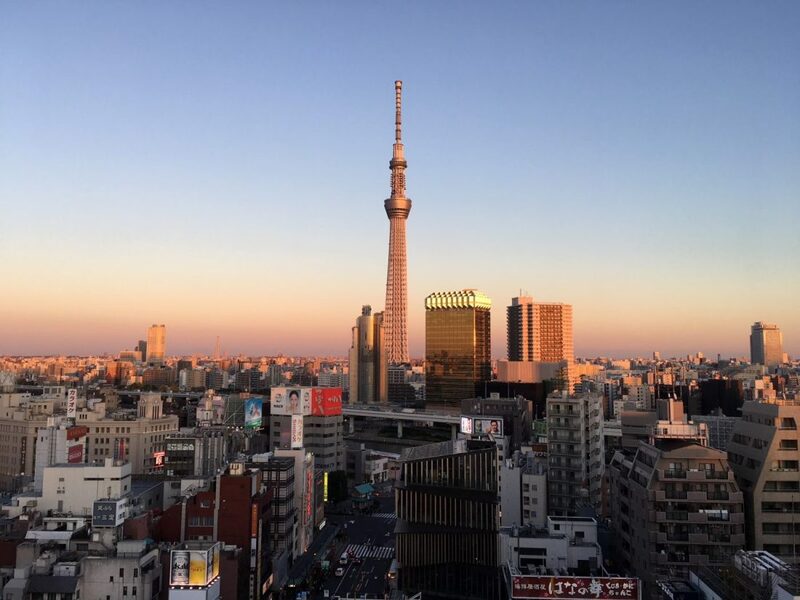 Here you’ll find awesome views of the Sky Tree and sunset. Rooms here vary in size and style, and unfortunately when we visited we were in a twin room because they were fully booked. Regardless, the bathroom was large and the room included an espresso coffee machine. The staff at the Gate Hotel were great – bringing whatever we needed to our room within minutes. Click here to see the latest prices of the Gate Hotel on Booking.com. Dinner at the Gate Hotel, great views of the Sky Tree! *Note: Planning to visit the 2020 Summer Olympics in Tokyo? Check out this in-depth guide which gives you all the details you’ll need. I’ll be the first to admit that when I saw this show listed on basically every “What To Do in Tokyo” article, I thought it was ridiculous. Watching a cheesy performance while being surrounded by tourists (not locals) did not sound like something I would like whatsoever. 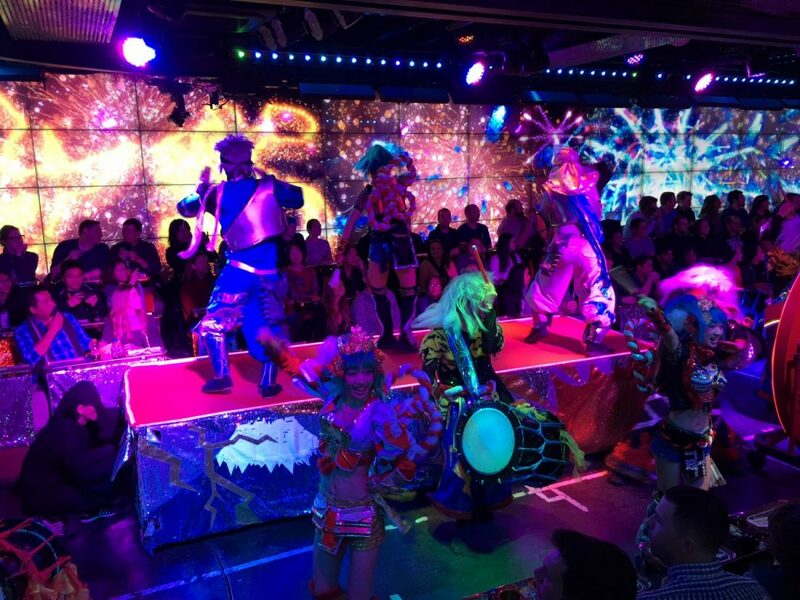 This wacky Robot Show ended up being one of the best things to do in Tokyo! I don’t want to give it all away, but it’s a theatrical show with people operating the “robots”. There’s dancing, singing and a storyline as well. There are also loads of intermissions, and booze is for sale during the show. Eat dinner before or after you go and buy drinks at the show. Where: Shinjuku neighbourhood. Click here for directions. Cost: 8000 yen ($70) at the venue. Book online with Get Your Guide to receive a $5 or more discount. The tickets will be emailed to you. Did you know that the tallest tower in the world is in Tokyo? The Skytree (which is a broadcasting / restaurant / observation tower), stands at 634 meters high! It’s the second tallest structure in the world after the Burj Khalifa in Dubai. Where: Asakusa neighbourhood. Click here for directions. When: Open 365 days a year. Cost: Tickets are around 2,000 yen ($17.70). Click here for ticket options and prices. 3. What To Do in Tokyo? Visit An Izakaya! Izakayas are local Japanese pubs or taverns where you’ll see groups of friends hanging out on weekends, or business people having some food and drinks after work. This is a sit down kind of place, with nobody standing at the bar – in fact, there’s not really even a bar in some cases. There’s a menu of “small” plates of food and you usually order one or two at a time to share. The popular drink is beer in a frosted glass. 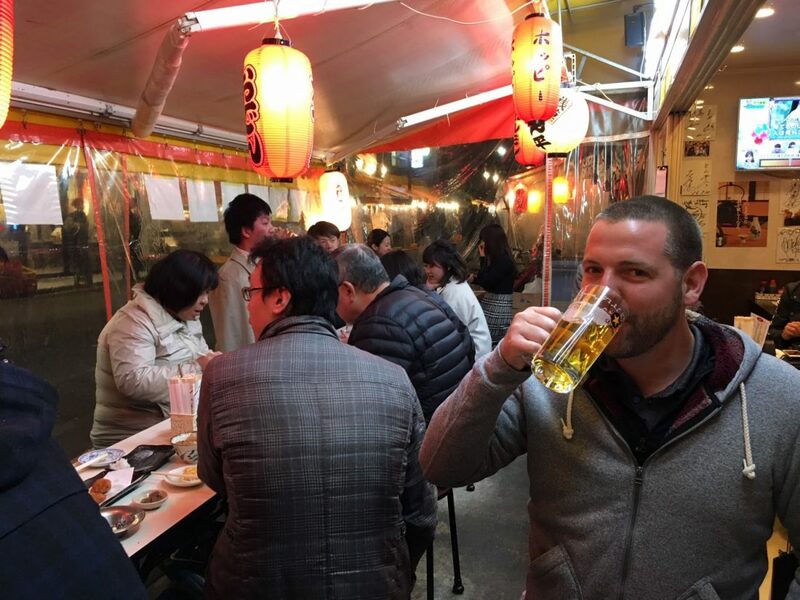 Having drinks and food at an Izakaya is one of the best things to do in Tokyo as it’s a great way to experience a night out with the locals. In Tokyo, we recommend checking out the izakayas on “Hoppy Street” which is located in the Asakusa neighbourhood. We stopped in here a couple of times when we were staying at the gorgeous boutique Wired Hotel, which is just minutes away. Where: Everywhere. We recommend “Hoppy Street” in Asakusa. When: Weekends are the busiest, but anytime during the week around 6:00pm onwards. Cost: There is a flat fee per person or per table. Dishes are around $5 each, same with beers. When considering what to do in Tokyo, think about joining a walking tour. 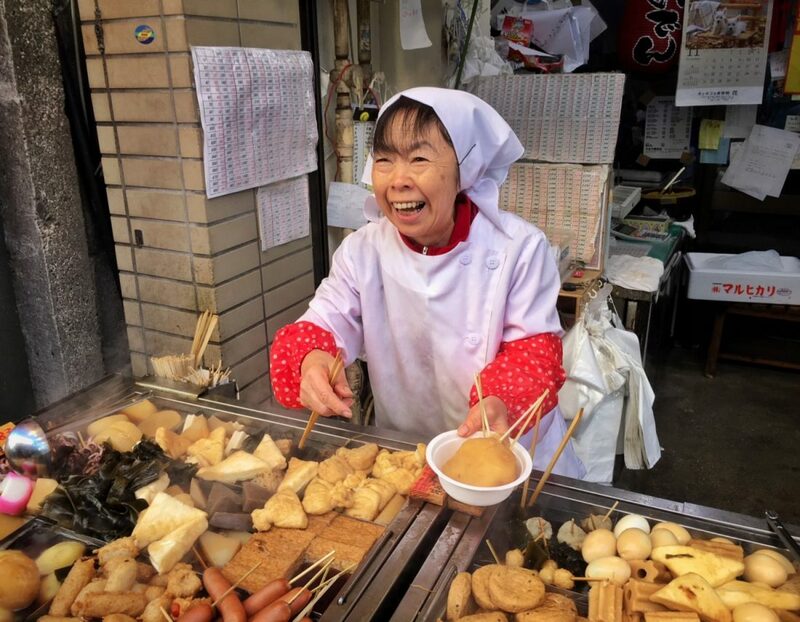 If you want to get a quick and informative introduction to Tokyo, eat some tasty street food, and see an area of the city that you probably wouldn’t otherwise, then I recommend joining the food & walking tour with Japan Wonder Travel. We set off to east Tokyo and explored the beautiful 670m long Sunamachi shopping street. This is where we found some tasty restaurants, quaint shops, inquisitive residents and small temples. This isn’t a touristy area whatsoever, and many of the family-run shops have been around for over 60 years – which is part of what makes this neighbourhood so unique! As a bonus, when we asked our guide Sammy what to do in Tokyo after the tour, she gave us some excellent local recommendations. When: The tour runs with a minimum of 1 person, and a maximum of 8. Contact Japan Wonder Travel to see which dates are available. The tour duration is around 3.5 hours. Cost: 9,000 yen ($79) / person. 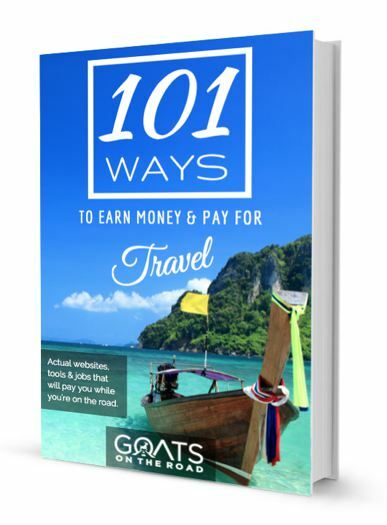 The price includes food, local transportation from the meeting point to the food street, an English speaking guide and a bottle of water. Whether you like fish or not, you’ll want to check out the Tsukiji fresh seafood market. Visiting here is an awesome experience and is something that should feature prominently on your Tokyo itinerary. 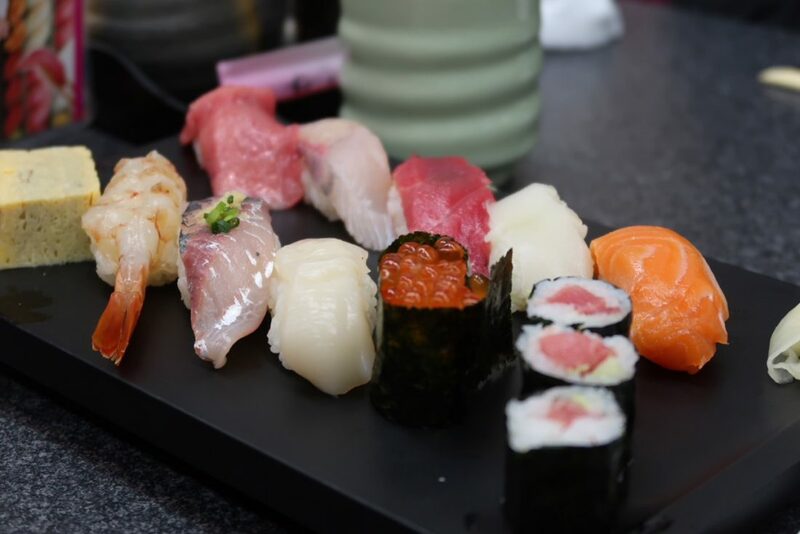 You can wander around the busy market and shop for food, or you can pop into one of the many small sushi shops and dine on some fantastic nigiri! Another option is to check out the commercial side of the market where they auction off massive tuna. The Tsukiji Market is one of the largest wholesale fish markets in the world and whether or not you see the actual tuna auction (which starts around 4:00am), you should try to check out the busy wholesale areas. The sushi at the Tsukiji Market was fabulous – so were the scallops, oysters, egg rolls, etc. etc. If you’re not into seafood, you can sample steamed buns, egg rolls, roasted sweet potato, matcha ice cream and more. But, for the most part, seafood is what’s on offer. Bonus tip – Make sure to sample the blow-torched scallop! Where: Chuo area. Click here for directions. When: 5:00am – 2:00pm. Closed on Sundays, National Holidays and some Wednesdays. Cost: Depends on how much you want to eat! Entrance is free, but if you want to join a tour, you will need to pay that fee as well. There are numerous ways you can eat sushi in Japan. 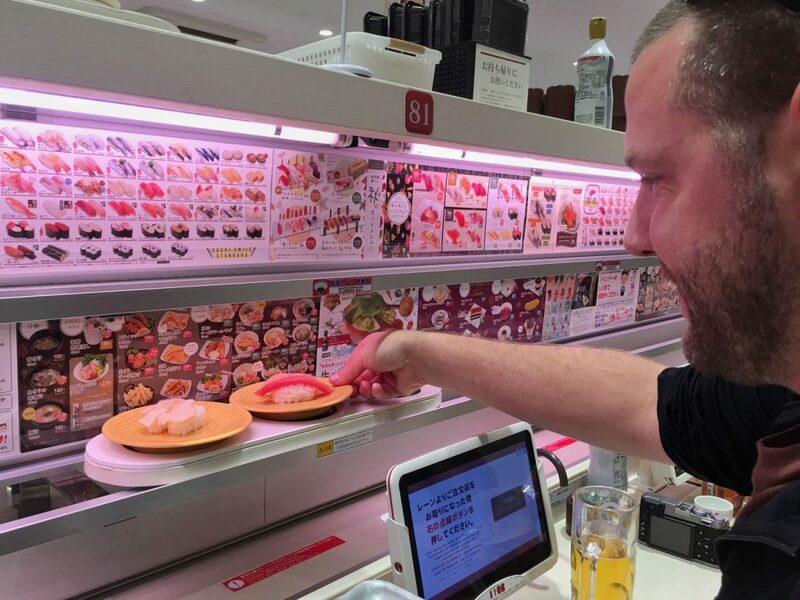 In Tokyo, make sure you check out one of the “touch screen” conveyor belt sushi places. Basically, you sit down on a small chair and in front of you is a small screen. You scroll through the menu and when you see something you like, you press the button and that item will be added to your order. You can choose from rolls, nigiri and other side items like tempura, fried chicken and soups. Once you’ve ordered, your plates of food will be delivered to you by a speedy conveyor belt. This isn’t a “nice” sit down place to have dinner, but it’s a unique experience and the sushi is fresh and cheap. For this type of sushi, we ate at Genki UOBEI in Shibuya area and can recommend it. Where: Shibuya area. Click here for directions to UOBEI. Cost: Pieces of nigiri are about $0.50 each. 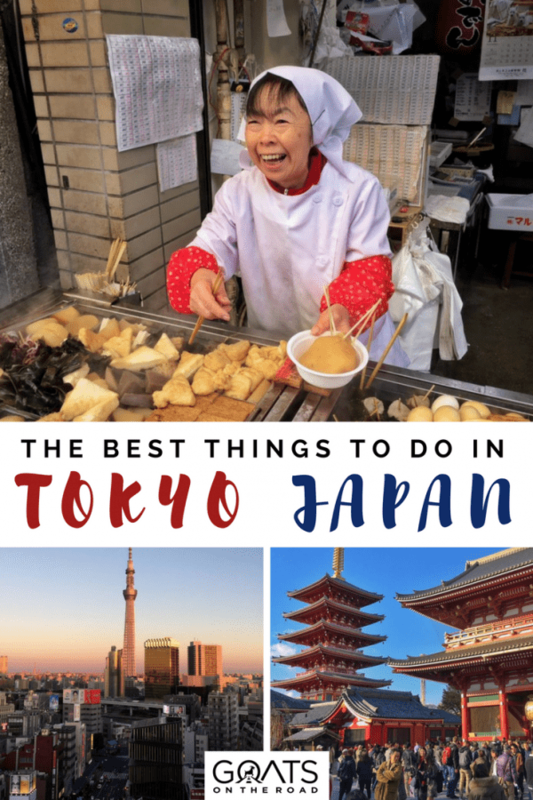 This is one of the best things to do in Tokyo! We joined the Cooking Sun class through Get Your Guide and even though I personally don’t like sushi, I had an awesome time. 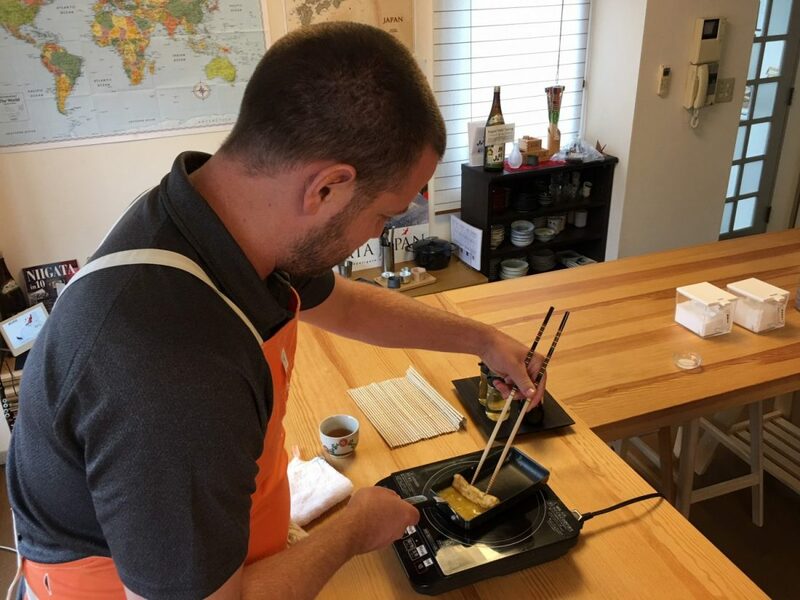 You’ll learn how to make sushi rice, nigiri, rolls, dashi (miso soup) and egg rolls. If you’re not a seafood eater, they can accommodate your needs and can prepare ingredients for vegetarian sushi. The instructor (and her sidekick) are so friendly and are great teachers. We were even given the recipes to take home with us. The venue itself is spotless and the utensils are high quality. Where: Shinjuku area. Click here for directions. When: Check online to see which dates and times are available. Classes are a maximum of 8 people. Cost: $75 / person. 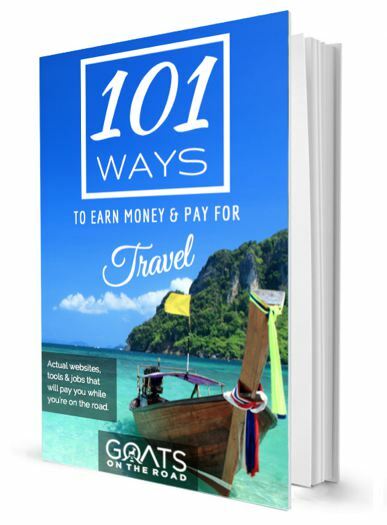 Visit Get Your Guide to see the latest price. 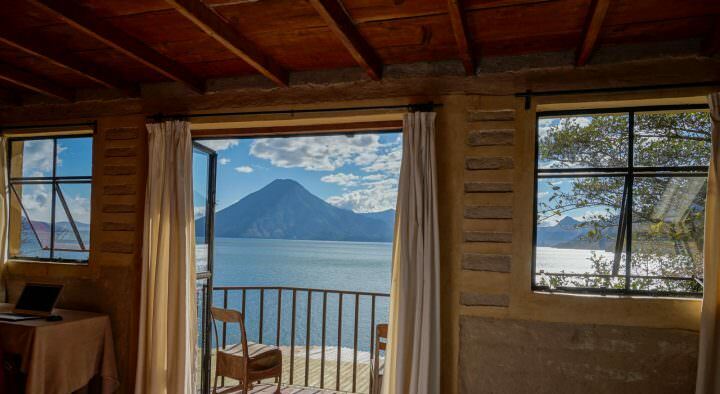 Free cancellation up to 24 hours. The oldest and most significant Buddhist temple in Tokyo is found in the Asakusa neighbourhood. 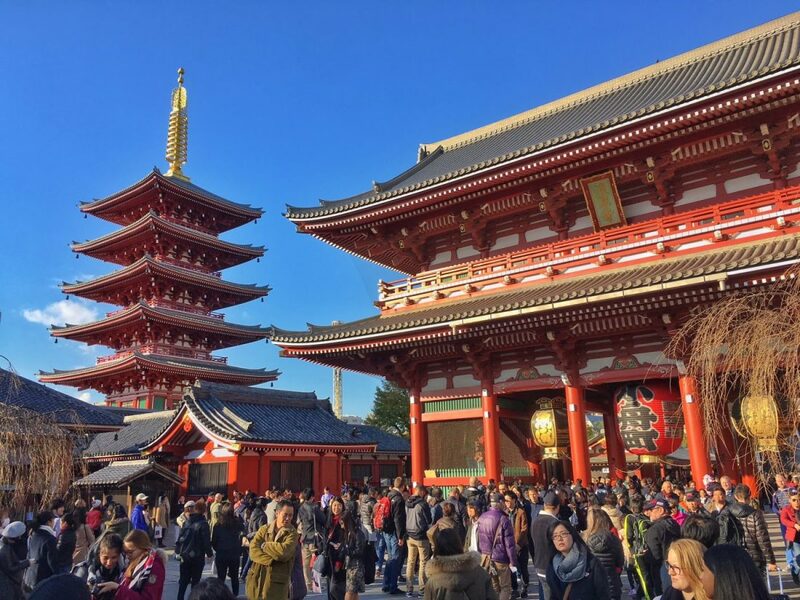 When thinking about what to do in Tokyo, make sure you add temple hopping on your list. Sensō-ji temple itself is beautiful, but so is the surrounding complex and area. It’s very busy on weekends. Not only is the temple a must visit, but the surrounding shopping area (Nakamise) has a history of several centuries. Wander around here and sample some of the local food, and check out the traditional souvenirs on offer. Make sure to visit the temple…maybe just avoid the weekends if possible as it can get pretty busy! After wandering around the concrete jungle for a couple of days, you’ll be craving some nature. 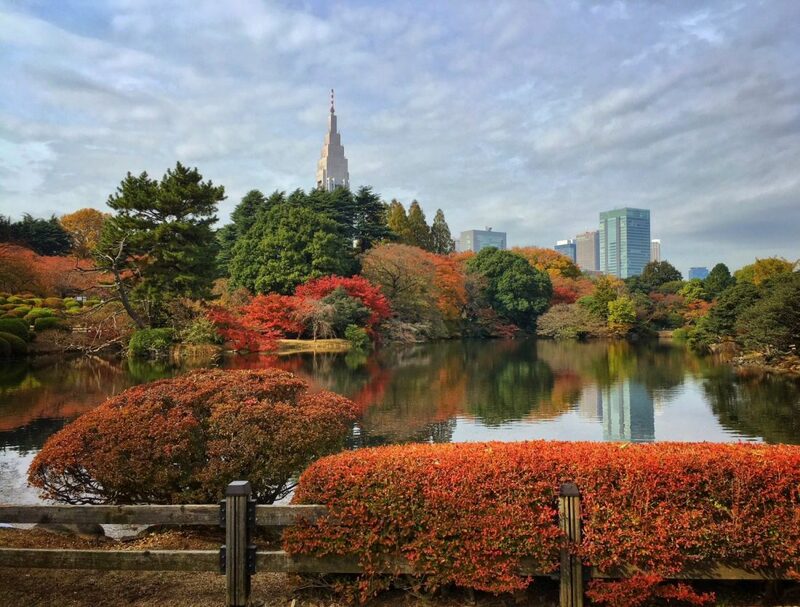 The Shinjuku Gyoen National Gardens are a great place to walk around and enjoy some fresh air and greenery. Previously, the park was the residence of the Naitō family during the Edo Period. These days, the 58 hectare park is open to the public. During the cherry blossom season, this is the perfect spot to view the flowers. But, it’s still a great park to walk around year-round (especially during autumn!). When: Year-round. But, it’s an especially great place to visit during the cherry blossom season, and autumn. Cost: 200 yen ($1.77) per person. Eating yakitori has to be one of the best things to do in Tokyo! If you want to have an experience while enjoying your skewers of food, make sure you dine at Memory Lane. If you’re looking for this lane, you’ll want to ask the locals for it by its Japanese name: Omoide Yokocho. Entering into the narrow, 100m lane, you’ll see numerous little shops with grills full of skewered meats and veggies. The smell in this lane is amazing! Each tiny restaurant has a few seats and narrow tables – there’s not a lot of room here, but the experience is great. 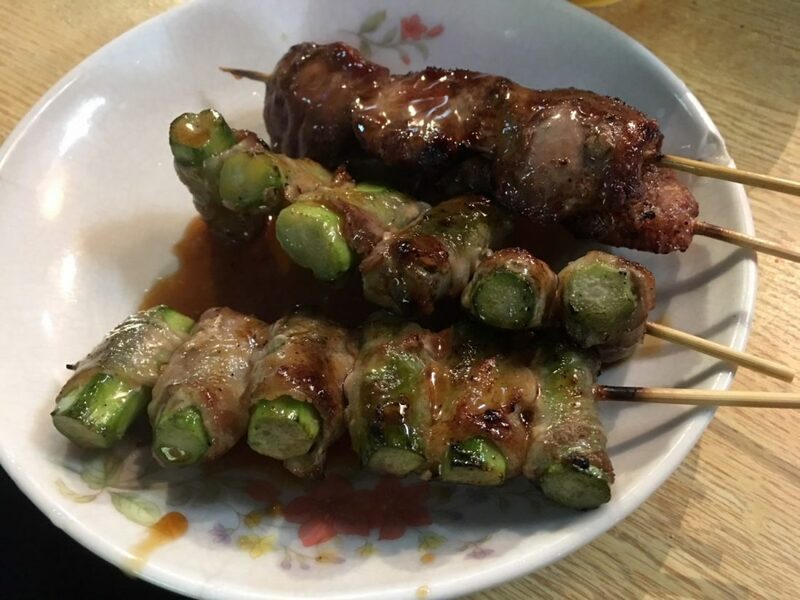 Most menus will have an English version as well, but if not, you can always point to some skewers that are already on the grill and ask for one of those. You’ll find a mix between “normal” (chicken wings, chicken breast and vegetables) and “weird” (animal organs, etc.). Make sure to try the leeks wrapped with bacon – delicious! You’ll find a mix of people here from tourists to business people and everyone in between. Where: This place is called Yakitori Street, Memory Lane, or Omoide Yokocho. It’s in the Shinjuku neighbourhood. Click here for directions. As a bonus, there’s also a website dedicated to the food vendors here! Check that out here. When: Visit here around dinner time, and later. Cost: Unfortunately, if you want to be full after eating here, you’ll have to spend some coin. For 2 of us, we spent $40 USD, which included numerous skewers, 2 beers and cover charge. Most (if not all) of these small restaurants have a cover charge, even if it’s not mentioned. Ask before you sit down. Another thing to note is that not all places are interested in having tourists at their restaurant. If there’s a menu or any sort of signage in English, then you can assume it’ll be a welcoming place for you. Like many cities, Tokyo is a place that offers lots to see and experience in between destinations. As the saying goes “It’s not about the destination, it’s about the journey”. When we were thinking about what to do in Tokyo, we had planned out all of the sites that we wanted to see, but knew we’d find lots of things to do just by wandering around. If you see that public transport will take you 15 minutes, maybe walk the 40 minutes instead. You never know what you’ll find along the way. Tokyo is one of those cities where you could spend months and not see it all. But, even if you have a short period of time, you’ll be able to get a good feel for the city and see quite a few areas if you are a savvy planner. Hopefully this list helped you figure out what to do in Tokyo – a city we’re sure we’ll return to in the future. Looking Back On 2012 – A Very Memorable Year! Such an amazing post. i’m very passinate to read blog posting but when i came to your blog then my thoughts has stopped and i was feeling myself to inside this place (tokyo). I’m visiting Tokyo soon and will be doing many of the things. Looks like you had a really good time, Tokyo is one of my favourite cities and there really is so much to do – more than most people imagine. I lived there for two years and still didn’t see it all ! I agree with your idea of walking the back alleys, it’s amazing what you come across. Oh wow, 2 years?! Awesome. What were you doing for work there? You’re right, there’s so much to see and do in Tokyo, such a fun city! That was fantastic trip. I loved every day of your Travel. Feel like I was there with you. Thanks guys… You are absolutely great. We are planning our trip to Tokyo right now and your blog post was extremely helpful, insightful and detailed. Thank you.